To access the Tools panel, click the Tools tab in the PressForward menu. The Nominate This bookmarklet allows you to visit a static page on the web and nominate the page content or draft it as a WordPress post. The Nominate This bookmarklet, once placed in your browser&apos;s bookmarks bar, can be used to nominate any item, even those not associated with RSS/Atom feeds. 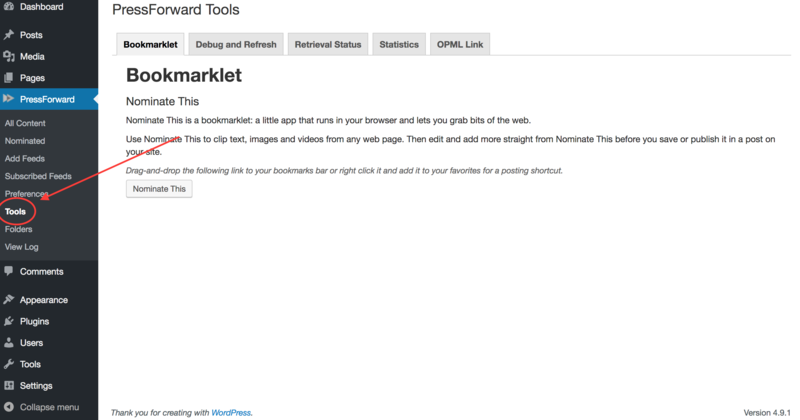 See Installing and Using the "Nominate This" bookmarklet for more details. The Debug and Refresh panel includes options and advanced tools for system administrators who are attempting to test, debug, or execute advanced functionality. Please note that these options are capable of breaking your retrieval process. Refresh: This button refreshes the feed retrieval process. It will attempt to restart a broken refresh process. If a previous feed retrieval cycle was completed, it will start the next one early. However, if the process is currently ongoing it will notify the system that you believe there is an error in the retrieval process, and the next time your site steps through the cycle, the system will attempt to find and rectify the error. Clean Up: This button will attempt to clean up feed items. Using this button will manually initiate the process of selecting feed items more than 2 months old. There is a chance of initiating this process simultaneously with a process triggered automatically every 30 minutes. If this occurs, error messages will likely appear in your server logs. This tab contains a progress bar that will indicate if the feed retrieval process is currently running and where in the process it is. New to version 5.0 is the Statistics tab which contains statistics about your PressForward installation by querying and compiling information in the PressForward Stats API endpoint. Please note that this interface is currently in Beta. Assemble Author Stats: This button will generate a list of the authors of published PressForward posts and a count of how many times they have been published. Assemble Valid Posts for Stats: This button generates a list of the feeds that published PressForward Posts have come from and a count of how many posts have published from that source. This tab contains an outbound OPML link that can be used to share your subscribed feeds as a subscription list with others.